One evening, right around when I should have been fixing dinner, I couldn’t go inside. 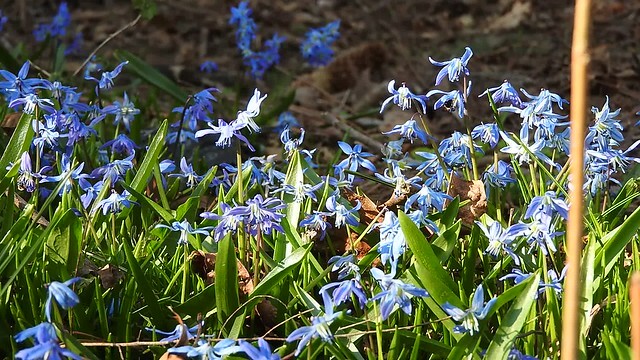 I was stuck on the deck, captivated by all the different kinds of bees flying through a patch of scilla looking for their own dinner. The girls and I laid on our bellies and watched honey bees, bumble bees, mason bees and assorted flies until our own dinner was severely delayed. We couldn’t tear ourselves away from the show until I discovered how to use the time lapse feature on my camera, then to keep our shadows out of the picture, we walked away. When we returned, ten minutes later, dinnertime for the bees seemed to be over and we finally headed inside to start on our own. This entry was posted in bees, photo challenge and tagged bees, flowers, spring, time lapse, weekly photo challenge. Food can wait, when you have things like this to watch! That’s right! Of course I paid for it a bit afterwards, hungry kids are not happy kids, but while we were watching the bees it was worth it! Lovely captures Jessie… The bees look so stunning.. 🙂 hope you had a nice time watching them.. I sure did, they are so much fun to watch go about their business! Thank you- it’s addicting to try to catch them in action!